President SBY, now in his ninth year as the democratically elected president of the Indonesian republic, must have had a quiet smile to himself on Monday when he met with Tony Abbott, Australia's latest prime minister, the fifth since he took office. The scene had a touch about it of the Queen in Helen Mirren's movie of that name telling the young Tony Blair 'you are my tenth prime minister'. Though Abbott wants us to think he is pioneering something novel, the visit also had a touch about it of the ingratiating Soeharto days when Paul Keating made Jakarta his first overseas port of call. The President, who has gone out of his way to befriend Australia and has no intention of spoiling that legacy in his last year in office, accommodated Abbott. He did not repeat his Foreign Minister's rejection of Abbott's tow back the boats policy. And the two leaders agreed that the trafficking of asylum seekers by boat to Australia was a problem for both Australia and Indonesia and that beating the practice will require more work both bilaterally and through the multi-lateral Bali process. 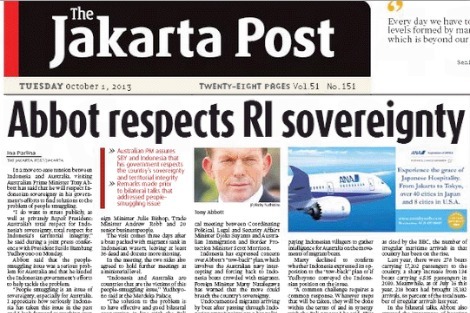 Abbott, for his part, reaffirmed Canberra's 'total respect for Indonesia's sovereignty and territorial integrity'. This is code for saying that Australia rejects any talk of secession in West Papua, an issue that was also discussed. The pledge also implies that Australia will not unilaterally tow boats back to Indonesia without Indonesia's cooperation. But judging by the hostile reception the idea has so far received from Indonesian MPs and others, that cooperation is not likely. Observing the Indonesian coverage of the visit, I was bothered by three things. First, thanks to the way the issue has been presented by Australia, Indonesian public reaction has been defensive. Indonesians feel that Australia is blaming them for the flow of boats. They feel that proposals to pay for intelligence, to buy boats so they cannot be used by people smugglers and so on are 'unilateral' (i.e. pushy) and pongah (conceited) and suggest that Australia has to step in because Indonesia is not doing its job. They also think it's unfair for affluent Australia to force boat people back to Indonesia which already has plenty of problems. One letter writer even suggested Indonesia will have to set an island aside to accommodate the influx of returnees. The issue is not high on Indonesia's agenda and a good outcome of the Abbott visit has been to highlight the matter more sharply here. It's also true that Indonesia could do much more. Its successful containment of terrorism, done in concert with Australia, shows that it could break up the organised crime rings that profit from the people smuggling trade. Perceptions of being dictated to, however, will only generate push back when consultation and collaboration are needed. Canberra could learn from Australia's enviable record of partnering Indonesia constructively in community development. Second, the issue is being misrepresented in Indonesia. Reporting on the Abbott visit, the Indonesian media have repeatedly described asylum seekers as illegal immigrants using the Indonesian term imigran gelap. Gelap means dark and suggests activity that is shadowy and suspicious. The Abbott Government uses similar language and is happy to see the issue defined this way. It allows a humanitarian and human rights issue to be reduced to one of criminality, justifies tough action and absolves one of a duty of care for those legitimately seeking sanctuary. Indonesia is not a signatory to the UN refugee convention. Refugees in Indonesia cannot legally work, move around freely or educate their children. A report on the issue by Human Rights Watch in June this year was entitled 'Barely Surviving'. It details detention, poor treatment, abuse and exploitation of refugees in Indonesia. Lastly, I suspect that the Prime Minister's visit has left Indonesians with a poor impression of Australia. Dewi Fortuna Anwar, political adviser to Indonesia's Vice President Boediono, described the Abbott policy as 'callous' and asked where was the humanitarian dimension in all this. Educated in Australia like Boediono, she expects better. Abbott's heavy handedness also contrasts sharply with the sensitive way Jakarta's popular governor, Jokowi, is managing complex change, for which Indonesians feel genuine enthusiasm. The business and boats orientation of the visit has left the impression that an Abbott led Australia sees the national interest principally in narrow, if not selfish, economic terms. It would have helped if, in addition to the boat issue, Australia's relatively generous formal immigration and refugee intake policy had also been highlighted during the PM's visit. Maybe next time Abbott might include not just business leaders in his delegation but some of Australia's respected migrant and humanitarian leaders who can explain to Indonesians that there is more to Australia than they saw this time. In the meantime, Indonesians will be clear about two things: that Australia is open for business, as Abbott declared on election night, but closed tight to desperate boat people fleeing war and persecution. Pat Walsh is currently visiting Indonesia. Inside Indonesia magazine, which he co-founded in 1983, will celebrate its 30th anniversary this November. Thanks Pat. Enlightening as always. I was particularly struck with your point about the need for us to include humanitarian and cultural leaders to the usual business hacks who get a gig on these prime ministerial trips. It would be good for informed Indonesians to see us as more than money grubbers and xenophobes. Yea verily, Mr Walsh. Thank you. Thank you for your clear and informed voice Pat. You words are heartening as many Australians are not proud of our hard line on refugees,reduction of foreign aid,obvious ignorance,and now perilously "pushy" arrogance and disregard for other nations.Abbott has revealed his lack of desire for understanding, education and long term vision for a this relationship and those with other close neighbours.I strongly agree with you that with only businessmen invited to this first visit there is a sense that all we really want to know is how can we profit from our neighbours. Abbott will need to listen to many voices and refrain from blunt rhetoric.As an elected leader of a democracy he is responsible for Australia's action on human rights and must uphold our humanitarian values. We cannot expect others (developing democracies) to take our very small share of a global refugee problem. Ambivalence appears to be a hall mark of the new government with Mr. Abbott taking one position when communicating with his electorate and a quite different one when he is in Indonesia. Thanks Pat. Your measured insights and local knowledge of Indonesia is invaluable. I find it reassuring to read about our neighbour and discover how they are thinking. Our media bias is quite limiting and potentially dangerous. Keep up the good work. Indonesians are a proud people, with an amazing and variegated cultural and religious history, which justifies their motto "Unity in Diversity". They would not appreciate either being put down, nor what they considered unwarranted interference in their country's affairs. The Javanese elite are used to a culture of sensitivity and respect in approaching leaders. Marty Natalegawa's reception of and response to Julie Bishop - she of the "death stare" fame - was their reaction to what they consider our crudeness and lack of respect for them and their country's sovereignty. I guess they felt someone who wasn't the leader was OK telling off someone at the same level. No harm done. With Bapak Tony Abbott, Bapak SBY showed suitable respect and consideration, which was reciprocated. In the world of the gamelan and wayang the approach of the Bankstown Rugby League team may not work. Actually it will fall flat on its face and prove counterproductive. Many posters to this thread appear to be suggesting a similar approach, which the Indonesians would consider both demeaning and threatening. I think we need to learn how to speak their language of feeling. Our language of thinking isn't succeeding. We are not on the same wavelength. Sad that, but it could prove disastrous. I agree, Pat, from what we have heard the exchanges were strong on opportunism and short on humanitarian concerns. While we refuse to acknowledge the brutal behaviour of Indonesia to West Papuans as we did with the East Timorese we are just whining spivs. And people are not being trafficked to Australia by anyone, they are legally seeking asylum. Trafficking is what we are doing by flogging refugees off to Manus and Nauru. I'm not sure, in this meeting with SBY, Tony Abbott was colluding with anything. Many Australians don't appear to realise that a softly softly approach will achieve more than moral grandstanding. I have real reservations about people who morally grandstand, with the usual inept quotation from some irrelevant piece somewhere else. This is the modus operandi of most eccentric Hyde Park speakers. No wonder they are heckled! Edward F, if you don't have time to read Fascism For Dummies. Emilio Gentile describes fascism within ten constituent elements: 1) a mass movement with multiclass membership in which prevail, among the leaders and the militants, the middle sectors, in large part new to political activity, organized as a party militia, that bases its identity not on social hierarchy or class origin but on a sense of comradeship, believes itself invested with a mission of national regeneration, considers itself in a state of war against political adversaries and aims at conquering a monopoly of political power by using terror, parliamentary politics, and deals with leading groups, to create a new regime that destroys parliamentary democracy; 2) an 'anti-ideological' and pragmatic ideology that proclaims itself antimaterialist, anti-individualist, antiliberal, antidemocratic, anti-Marxist, is populist and anticapitalist in tendency, expresses itself aesthetically more than theoretically by means of a new political style and by myths, rites, and symbols as a lay religion designed to acculturate, socialize, and integrate the faith of the masses with the goal of creating a 'new man'; 3) a culture founded on mystical thought and the tragic and activist sense of life conceived of as the manifestation of the will to power, on the myth of youth as artificer of history, and on the exaltation of the militarization of politics as the model of life and collective activity; 4) a totalitarian conception of the primacy of politics, conceived of as an integrating experience to carry out the fusion of the individual and the masses in the organic and mystical unity of the nation as an ethnic and moral community, adopting measures of discrimination and persecution against those considered to be outside this community either as enemies of the regime or members of races considered to be inferior or otherwise dangerous for the integrity of the nation; 5) a civil ethic founded on total dedication to the national community, on discipline, virility, comradeship, and the warrior spirit; 6) a single state party that has the task of providing for the armed defense of the regime, selecting its directing cadres, and organizing the masses within the state in a process of permanent mobilization of emotion and faith; 7) a police apparatus that prevents, controls, and represses dissidence and opposition, even by using organized terror; 8) a political system organized by hierarchy of functions named from the top and crowned by the figure of the 'leader,' invested with a sacred charisma, who commands, directs, and coordinates the activities of the party and the regime; 9) corporative organization of the economy that suppresses trade union liberty, broadens the sphere of state intervention, and seeks to achieve, by principles of technocracy and solidarity, the collaboration of the 'productive sectors' under control of the regime, to achieve its goals of power, yet preserving private property and class divisions; 10) a foreign policy inspired by the myth of national power and greatness, with the goal of imperialist expansion. Or in other words: Australia Today. Edward F, if you wish to learn a thing or two about Abbott's Strong Australia. Emilio Gentile a professor at the Sapienza University of Rome has written extensively on the subject of Fascism. Alternatively you may wish to read 'Fascism for Dummies'. Thanks very much for your comments, A. Orange. Yes, he is a major worry – I grew up under Thatcherism, had a brief reprieve in the form of my initial 3 months in Oz under Keating, then the ghastly, deadening Howard years. The term fascist is not invoked lightly, but Abbott’s stance on refugees, his arch conservatism, croneyism and sheer contempt for any fair notion of the public interest, all seem characteristic of the term. The conflict in Syria has led to one of the worst humanitarian crises in the world today. And the need for a peaceful solution is great. I hope that Australia's successful aid program remains a priority for our Government. We must not ignore the needs of those lying at our gates simply because their communities do not hold trade or economic interests for us.